New business locations are always a challenge. I've been looking for new locations for more years than I count. There's no easy on off switch we can turn to get to our next spot. Sometimes we get suggestions from models and then other times friends tell us about a potential location. Sometimes we hire location scouts. Sometimes we just stumble into places. The bottom line here is that we are constantly on the lookout for new businesses. Large ones and small ones. It doesn't matter. Case in point - Bill Piere Ford. This one lands in the "stumble onto it" ledger. My business partner/wife Deborah gets her car repaired here. I went to the shop with her to pick up the car and glanced into the repair bay. It was perfect. Clean, simple, professional, colorful, not a lot of logos to be retouched. That's a lot of what we look for in stock photography. A perfect place to do a small business shoot. We negotiated with Bill Piere Ford and they allowed us into the location on a Sunday. Our models included Jose Gandra, Nick Espinoza, Lauren Blier, Conseulo Javier, Carolyn Wright, Jose Gandra and Ryan Gessel . The trick here was to show off the concepts of blue collar workers working as a team to solve problems. 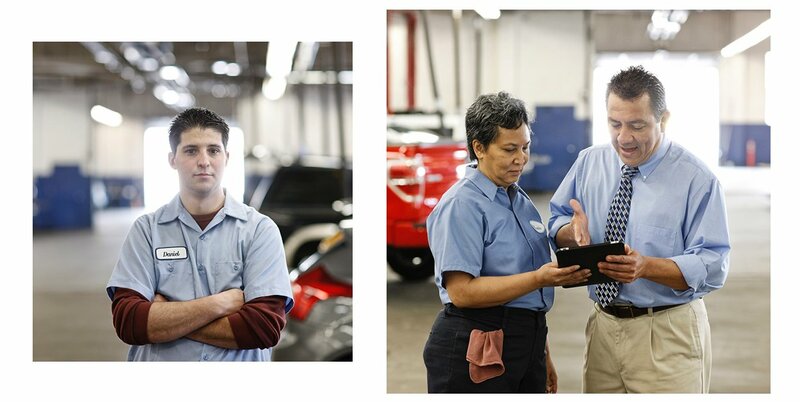 We needed models who could play the blue collar part, and one of them needed to look like he owned the company. None of these folks are professional actors and none of them work at a car repair shop. I think we did a fair job of making it look real while creating some visual metaphors that could be used by our agencies to sell commercial photographs. Each location presents its own problems and solutions for imagery. A lot of time the potential location will be too busy visually or maybe it's too dark for us to work in. Bill Piere's repair shop was filled with natural light from the windows and it helped surround the models with great light. Finding models who can portray real situations is always the fulcrum around these shoots. We love people who just simply don't have an oversized sense of themselves. They forget about how they look and let the photographers work them into the situation. These guys are believable. Withouth them we don't have a shoot.